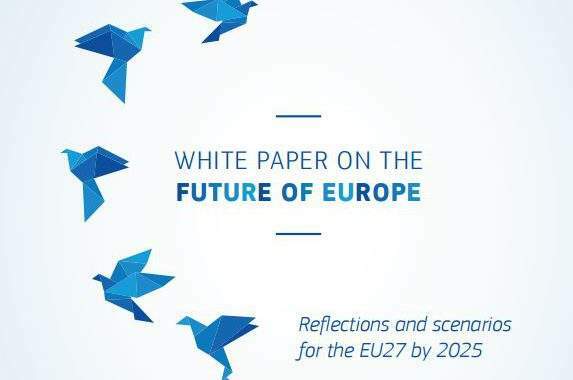 The Commission’s ‘White Paper on the Future of Europe’ outlines five scenarios for a ‘new chapter’ of European union for the EU27, but fails to answer the key question – what do citizens want from Europe. Despite European Commission President Jean-Claude Juncker’s call for “leadership, unity and common resolve” in taking the EU27 forward after Brexit and the White Paper‘s stated aim to “advance our project in the interests of our citizens”, his five scenarios for the future of the EU – ‘carrying on’, ‘nothing but the single market’, ‘those who want more do more’, ‘doing less more efficiently’ and ‘doing much more together’ – reflect the realism of working for a compromise between 27 Member States rather than a true vision of a Europe for its citizens. What the paper does well is to identify the challenges for Europe and its citizens in the near future and restate the case for European union in a changing and uncertain world. Whether it is a falling share of the world economy, aging populations, technological progress, security concerns or declining levels of legitimacy in mainstream politics and institutions, Europe must be “quicker to interact with citizens, be more accountable and deliver better and faster on what has been collectively agreed”. Since it was published on 1 March, conflicting reports have stated that the true purpose of the White Paper is to support either a ‘multi-speed Europe’ (Scenario 3) or ‘more Europe’ (Scenario 5), although ‘carrying on’ (Scenario 1) would be the default option. But to what extent do the scenarios address the main concerns of citizens, which, according to the Autumn Eurobarometer, rank as immigration, terrorism and the economy? Divisions over the future of the EU were apparent at the informal meeting of the EU27 on 10 March. Member States are split, with some preferring to “loosen intra-EU ties” and others wanting “deeper dimensions of integration”. A ‘multi-speed Europe’ – ‘those who want more do more’ – has been touted by President Juncker in the past as a solution to the divergent priorities of the Member States, but would not be welcomed across the EU. The Visegrad countries, in particular, fear that a multi-speed Europe would cement existing divisions between Member States and lead directly to disintegration. 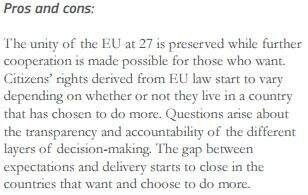 Furthermore, citizens’ rights, and the EU’s ability to respond to citizens’ concerns, would depend on where people lived, as acknowledged in the very paper, and there could be issues around accountability and transparency due to there being different layers of decision-making. 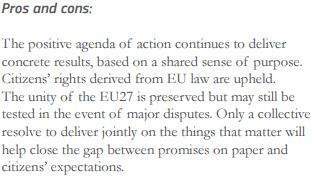 Conversely, ‘doing much more together’ would extend citizens’ rights under EU law and enable the EU to function more effectively and efficiently in responding to citizens’ concerns. However, questions of legitimacy may offset any improvements to the functioning of the EU. The major drawback of ‘carrying on’ is that, though it would continue a “positive agenda” and make “incremental progress” on the economy, security and immigration, it would do little to counter the rise of populism in the EU and would not guarantee that the “gap between promise and delivery” will be closed. Given the political juncture in Europe and the constant threats to the European project, a ‘business-as-usual’ approach, as this scenario outlines, is not an option as it could lead to the collapse of the EU. Of the other, less likely, scenarios, both ‘nothing but the single market’ and ‘doing less more efficiently’ would result in a more focused and less active Union, whilst the former may lead to the rights of EU citizens becoming restricted over time. Both may continue to increase economic integration, but would weaken the EU’s capacity to act on immigration and terrorism. One way of doing this would be to use crowdsourcing to solicit the views of EU citizens. 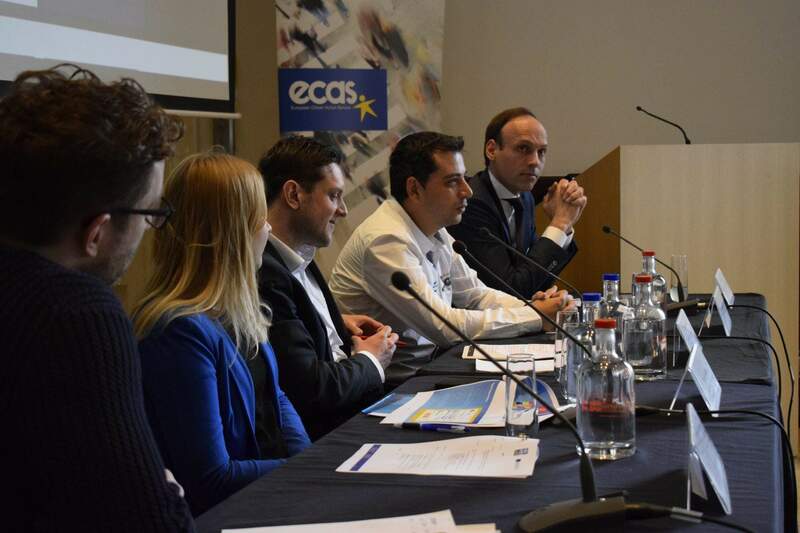 ECAS’ study on crowdsourcing emphasises the value of this tool for engaging the unengaged and reducing the gap between EU decision-makers and citizens. This could, in turn, transform the relationship between them into more of a partnership and address one of the key objectives of the White Paper – to restore trust, build consensus and create a sense of belonging. 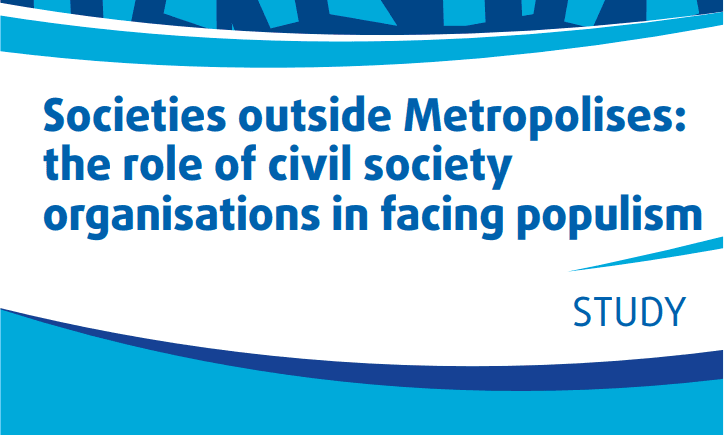 As the White Paper states, Europe needs to “speak with one voice”, stand up for “free and progressive trade”, build an “inclusive, competitive, resilient and future-proof” economy, develop social rights to keep pace with “the changing world of work”, reignite trust in free movement and close the gap between promise and delivery. It can only do this with the consent of its citizens.